An editorial in today’s San Diego Union-Tribune was critical of OB’s “Torrey Pines Hero”, the “Man of the Hour” – the guy who brought to a halt – temporarily – Tuesday’s cutting down of two of the trees – Geoff Page. The editorial took Page to task and mocked his compassion for standing up for the Torrey Pines on the 4600 block of Saratoga in Ocean Beach. Page had physically blocked work crews from cutting down one of the Torreys, demanding that the workers, the arborist, the city – somebody! – produce the required permits for what they were doing. Page insisted that the work permit as well as the street control permit be shown upon request – as is required. After hours of delay, the permits were brought to the site. Page and other locals who had gathered in support of him and in opposition to the city’s action relented and walked away. Crews finished cutting them down – and some crew members posed in front of the stumps as if they were trophies. The editorial claimed the paper understood Page’s”desire to save these quintessential San Diego trees and have them stand as they have for decades,” but continues by raising the risk of falling trees, saying the city’s action was appropriate – and then mounts the campaign to cut down all the risky trees – without distinguishing any of the more vulnerable tree species from the more stable ones. Certainly, at risk trees in the area need to be dealt with. But not all tree species have the same risk. Eucalyptus trees are much more likely to topple over than Torrey Pines, for example. The Torrey Pines that have grown for over 80 years on that block of Saratoga have withstood the winds of the worst storms over those decades. One fell in 1988 – that is true. But none have fallen since – over these last 28 years. We don’t have records of how many fell from the time they were planted back in the 1930s up to the 1980s. The editorial did mock Geoff Page’s stand. All that he did was insist that the city or the work crew and their company, Atlas Tree Service, produce the documents that are required to be on site and are required to be produced upon request. His stance was with his physical body – much like other people who have placed their bodies on the line for a good cause. Page’s stand was only for a few hours, true. Plus Page has had some experience in different types of construction sites and is knowledgeable of what cities and companies are required to have on those sites. He was holding the city, its arborist and the tree company up to the legal standards required of them. And he did relent – and leave – once he was satisfied with what documents that were produced, which took hours after his requests. He wasn’t happy that the trees came down, of course. And neither are scores of OBceans. The proper and required process was not followed by the city nor by the tree cutting service. Proper notice to the community should have been given, and presentations to the OB Planning Board and the OB Town Council should have been made, accompanied by the proper documentation as to the nature of the threats and some scientific data demonstrating such. The company did not give the required notice to the residents of the block – not until day 3 was proper signage displayed. Again, neither the company nor the city had the proper permits on site, as required. The city claimed they didn’t need to follow process because of the “imminent threat” that 2 of the Torrey Pines posed. They had received some residents’ complaints that the last terrific wind storm of Monday, Feb. 1st, lifted trees and pavement up, turned them and made them dangerous. Still, no one in the community was shown any proof of the threats – nothing scientific was demonstrated to OBceans about why these trees had to be cut down. These drastic actions could have been prevented if the city had maintained the Torrey Pines with periodical trimming. No appreciation was shown by the city, the arborist, his boss or the work crews of the historic nature of Torrey Pines and that they are a protected species. OB has a special history with Torrey Pines (as does Point Loma). The city claimed that there have been over 500 trees that have fallen recently, but when asked ‘how many were Torrey Pines?’, it was admitted that there had been very few. Most trees that fall in San Diego are Eucalyptus. 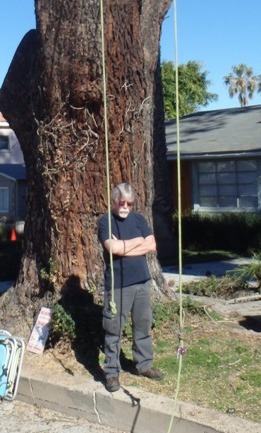 The city has historically displayed a callousness toward OB’s Torrey Pines; this was seen when the city contracted with a tree service to cut down a Torrey on the 4600 block of Long Branch Avenue a few years ago, only to be thwarted by locals who hired a Torrey Pine specialist who proved that the tree was healthy and that it grew at an angle. One local paid for a trim. Plus the OB Planning Board agreed to saving it. This action by the city follows a troubling trend of snubbing OB and its organizations, such as the Planning Board. All and any changes to the public right of way, the infrastructure and protected species of trees need to be presented for approval – not just notice – to the local Ocean Beach planners – at the very least. Just to add to this, my insistence on seeing the permits was designed to stall the work long enough to have the right people jump in and postpone the action. By the right people, I mean the mayor and the city council person who did not respond at all. When Atlas said they did not have the permits, I knew it would take some time to get them and I believe both permits were created as we all stood there, which explains why it took almost five hours. I was extremely disappointed with the SDPD. Anyone working in a City street without a traffic control permit is supposed to be shut down and told to vacate the street, I know this from past experience performing a lot of work in city streets. I asked the several police there several times to make Atlas move off the street and they refused. One officer said they were not trained in this kind of matter, which is inconceivable, and when I then asked that he contact an officer who was, he refused and said it was not his job to help out, he was there to keep the peace. Five officers were there the whole time to protect Atlas from a bunch of 60 plus year old protesters, how’s that for a priority? In the picture, Geoff actually looks like the Lorax. When Geoff asked the SDPD officers if they could contact a police officer who might know about the closed-street sign regulations, the response was, “No. But you can call a cop.” WTF? I wrote a response to the UT editorial, 350 words. They have a policy of 150 words for letters to the editor. I said I expected they would allow me a a bit more since I was the subject of the editorial, as I have often seen them do with others who were the subjects of editorials. They said no so I said forget it. I’ve never been a fan of the paper anyway but it did make me wonder why they decided the incident warranted an editorial. In the piece they said ”so the City’s action seems appropriate.” Newspapers are supposed to question not just agree. The UT did nothing to investigate the story, they recorded what happened and then decided to throw in two cents more. It is a shame that a major city like ours hasn’t had a real newspaper since the LA Times decided to end its San Diego edition. Page was well within his rights to passionately defend long-time fixtures of OB. Thank you Geoff. If permits were printed while he was defending the trees then the city has a serious problem and needs to hold someone accountable. Hopefully Zapf is investigating. Kirk, We contacted Zapf’s office that morning. We got crickets. just ignore those idiots at the UT not even a real newspaper! I would tell Geoff to be, shall we say, circumspect, criticizing the SDPD, as they are subject to show up your house when they are dogged publically. I think I have an awesome OB parade float idea. It might even be worth Zapf being there this year.